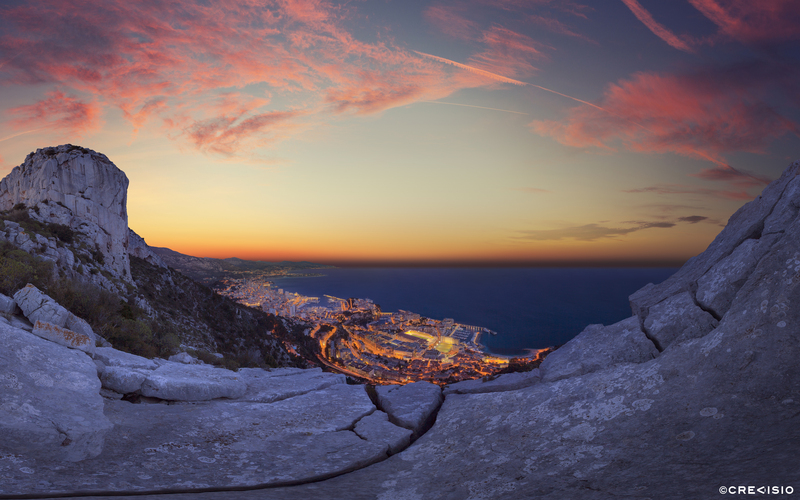 Monaco sunrise panorama taken from a cliff above the Principality. This 180 degree panorama photograph was shot from a low height just above the cliff rocks themselves, creating a unique point of view and photo composition, highlighting the rocky surface in the foreground. The 75 megapixel photograph has a full resolution of 11,064 x 6,915 pixels at 300 dpi. You may download a free wallpaper version for personal use by clicking the photo above or the link on the side. For commercial use, please contact Crevisio.